International Technological University (ITU) is announcing a partnership between its Digital Arts Department and TechShop, a member-based workshop facility offering access to over $ 1,000,000 worth of powerful equipment, digital design software and instruction. The partnership between ITU and Tech Shop is a result of their membership within The San Jose Silicon Valley Chamber of Commerce. We are pleased that both of our members, ITU and Tech Shop, are benefitting from one of the chambers core values: helping our members create mutually beneficial connections with each other, said Matthew Mahood, the Chambers President & CEO. TechShops mission is to empower people to build their dreams. Members have access to equipment for rapid prototypingeverything from mills and lathes to 3D printers and laser cutters. We are thrilled to work with ITUs Digital Arts Department, said Michael Catterlin, Manager of TechShop San Jose. 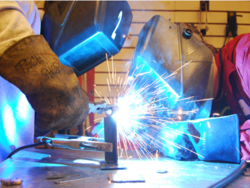 TechShop is centered around educating the community and offering a supportive environment to students, entrepreneurs, artists, and others who want to make things but lack the tools, space or skills. The Digital Arts Department at ITU, a graduate university in Silicon Valley, is currently offering a course called Manufacturing Cinematic Spaces taught by Professor Marina Christodoulides. Professor Marina is co-founder of RECESS, an interdisciplinary design collective, and designer for innovation studio at MKThink. The course uses film as a pedagogical tool for an architecture design studio. Students learn about space in a new way by analyzing films. By the end of the semester, students will incorporate class concepts to design and represent space in three dimensions through digital and physical models. After giving the students comprehensive equipment training, TechShop will provide them with access to their state-of-the-art Computer Numerical Control (CNC) equipment to fabricate physical models of their final designs. As Professor Christodoulides puts it, TechShop is making tools that were once only available to manufacturing and production facilities available to everyone today. It is the contemporary shared woodshop. Students at ITU will be trained to use laser cutters and 3-D printers by TechShop staff. Though this is a pilot program for experimentation and research purposes, Digital Arts Chair Cedrick Chan, a media and entertainment professional who worked on films such as the Star Wars prequels, Hero and The Mummy Returns, notes: We expect that student membership will be an integral part of the departments curriculum. Students are already recognizing the tactile and digital influence of their work. To learn more about the Digital Arts Department, visit http://www.itu.edu/digitalarts. With seven departments providing top-quality academic and practical training, ITU offers exceptional certificate, graduate and doctorate level programs in Electrical Engineering, Computer/Software Engineering, Engineering Management, International Business, Interdisciplinary Sciences, and Digital Arts. All of ITUs programs aim to build competent engineers, engineering managers and business administrators with a deep understanding of cutting-edge theory and hands-on practical application in their respective fields. ITU is recognized by the Bureau of Private Postsecondary Education (BPPE), and has been granted candidacy status by the Accrediting Commission for Senior Colleges and Universities of the Western Association of Schools and Colleges (WASC). * This status places ITU on the U.S. Department of Educations database of recognized institutions of higher learning and the Council for Higher Educations Listing of Accredited and Candidate Institutions (CHEA). Candidacy for Accreditation is a status of preliminary affiliation with the Commission, awarded to institutions for a limited period following a specified procedure for institutional self-study and on-site evaluation. Candidacy is subject to renewal. Candidacy is not accreditation and does not ensure eventual accreditation. It is an indication that an institution is progressing toward accreditation.